This post is sponsored by Jo-Ann Fabric and Craft Stores. All opinions are 100% my own! 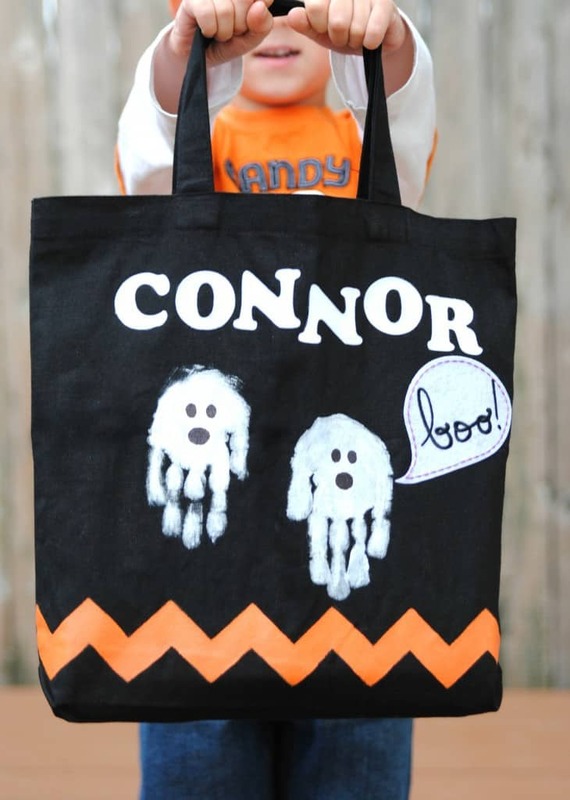 Today’s craft project combines two of my favorite things – Halloween and handprint art! 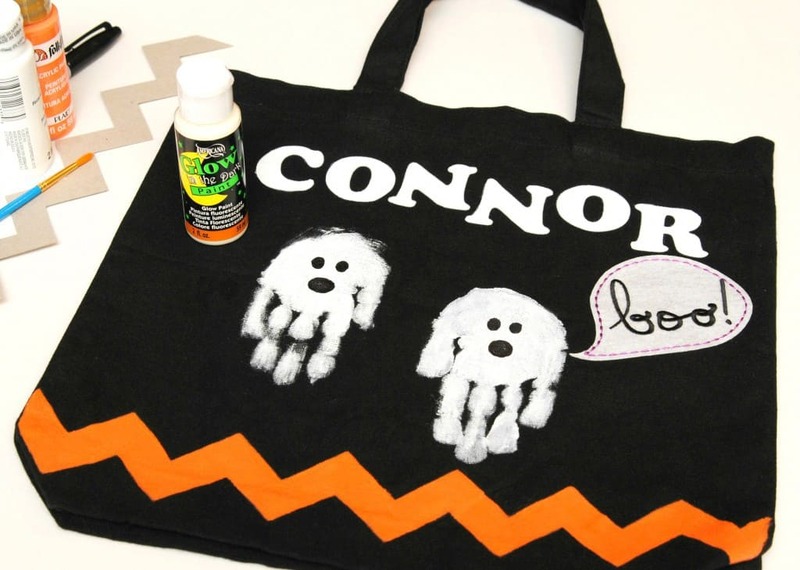 I was thinking that I wanted to make Connor a personalized Trick-or-Treat bag this year for Halloween but wasn’t sure what I wanted it to look like. Then I saw handprint ghosts on Pinterest and I had an idea. I could make Connor a personalized Trick-or-Treat bag with handpring ghosts! Isn’t it so cute? I headed to Jo-Ann’s for my supplies. I needed a black tote for sure and then I just looked around for inspiration. I came across a “Boo” Felt Patch on clearance so I threw that in my cart. Then I found Glow-in-the-Dark paint and had to get it. I thought that would be perfect since it will be dark. I started with Connor’s handprints. I painted his hands white and pressed them in the center of the bag. When the paint dried, I used a black sharpie to create the eyes and mouth on each ghost. Next, I painted the orange zig zag strip along the bottom. I was originally going to have more but ran out of room. Then I ironed on the letters of his name and the “boo” patch. Finally, I painted over everything except the “boo” patch with the glow-in-the-dark paint. Once everything dried I showed Connor and he loves it! He has already been putting his toys and stuff in it. Last night he insisted on taking it to dinner with us. I love how it turned out! I was a little nervous at first when I started the project but I couldn’t be happy with how it looks. And guess what?! 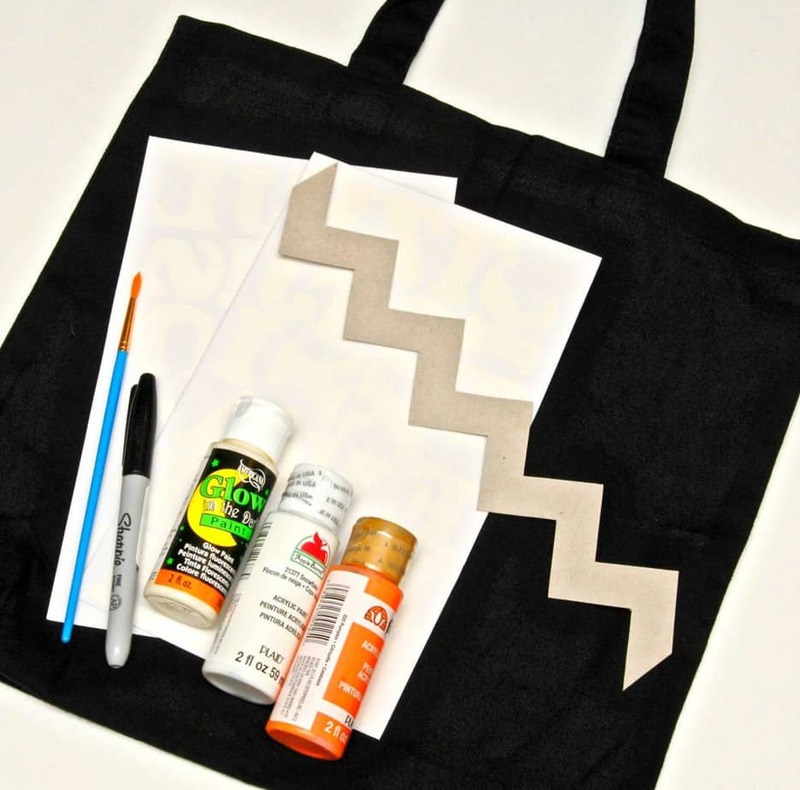 I have a 50% off coupon for you all today so you can get all the supplies needed to make your very own personalized Trick-or-Treat bag. Print the coupon below and head over to your local Jo-Ann store. Thank you Jo-Ann Fabric and Craft Stores for sponsoring this post. All opinions are 100% my own. 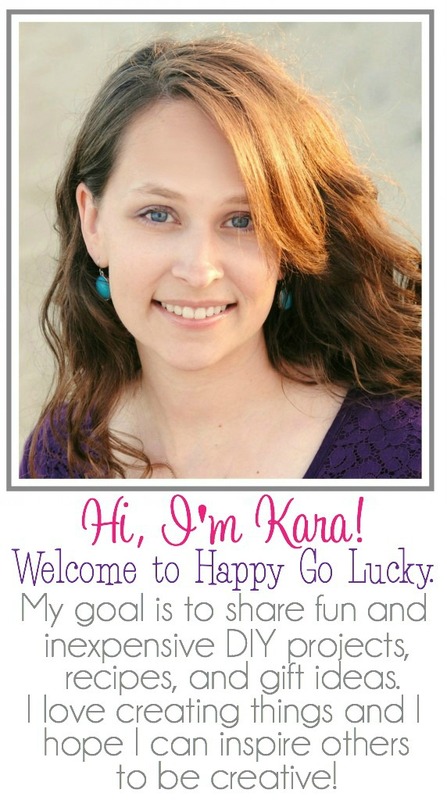 I am excited to work with a company whose mission is to spark creativity that lives in every person. love homemade crafts — like the cheveron pattern you did too! oh my goodness those are too cute. I may have to do that to my kids bags now. How adorable! I love the hand prints (with faces – nice touch!) and the chevron. What a cute trick or treat bag! Looks like an easy craft to do with the kiddos. This is the cutest! Love how clever and unique this is. What a fun way to preserve memories, love it! This is such an adorable bag! It looks like it’s really well made too which is a big plus for me! That is awesome! I love the idea. The Ghost hands are fantastic! Debbie Denny recently posted…NOT FOR PROFIT By Glenn Shepard, MD! Book Tour! Oh my goodness if that is not the cutest thing I don’t know what is! Perfect to do every year with your little one. I think I am going to do this now with my boys. Thank you so much for sharing. So adorable. Your little one is adorable! You came up with a really cute idea for this and it will hold lots of goodies! 🙂 Love that you used glow-in-the-dark paint too. What a cute boo bag! That will hold a load of goodies, too! That bag is just the cutest! I love the boo patch, too. I wish I could be that creative. that’s a super cute trick or treat bag. and i LOVE handprint crafts. adorabls!! That’s a great activity to do with the kiddos. Beautiful bag, they should be proud! 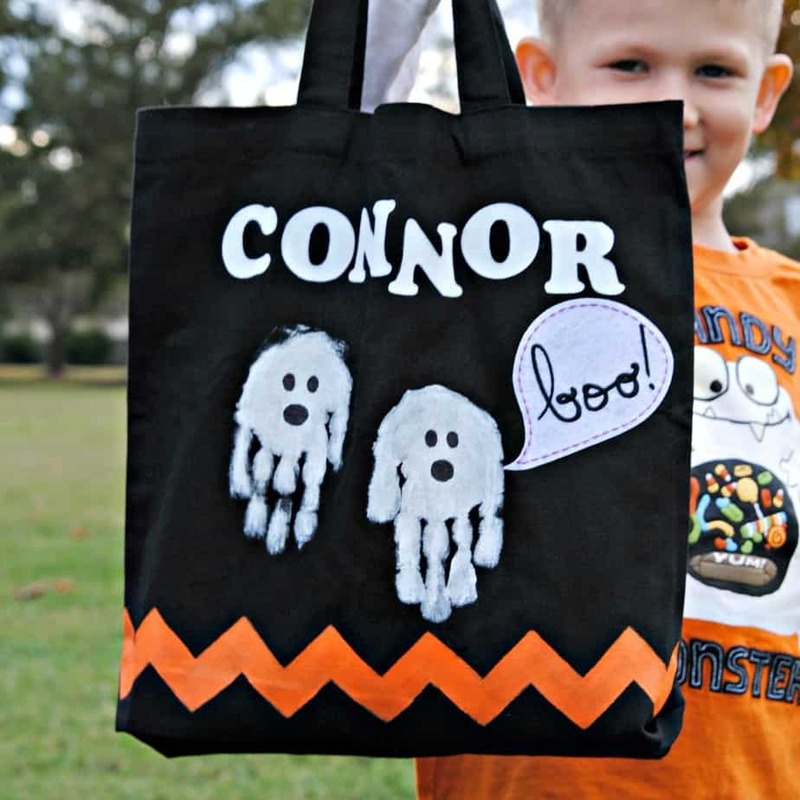 What an awesome Halloween tote! Thanks for the money saving coupon! That is adorable and you can use that treat bag for years too! So cute! I love the little hand print ghosts! Oh how fun! You can do anything with hand and footprints! Cuteness. What a cute trick or treating bag. I love that they are personal and a great memory. I can spend hours in JoAnn Fabrics. They also offer great classes too!! Now that’s a great idea, never thought to do something like this! That’s super cute! I might have to try that! This seems like a good craft idea that will be good for all year long and for different projects with the kids. Don’t kids love when they can help – and then show off their work?? Super cute! Thanks for the coupon too! Adrianne recently posted…Chopped Vegetable Beef Stew in the Wonderbag! 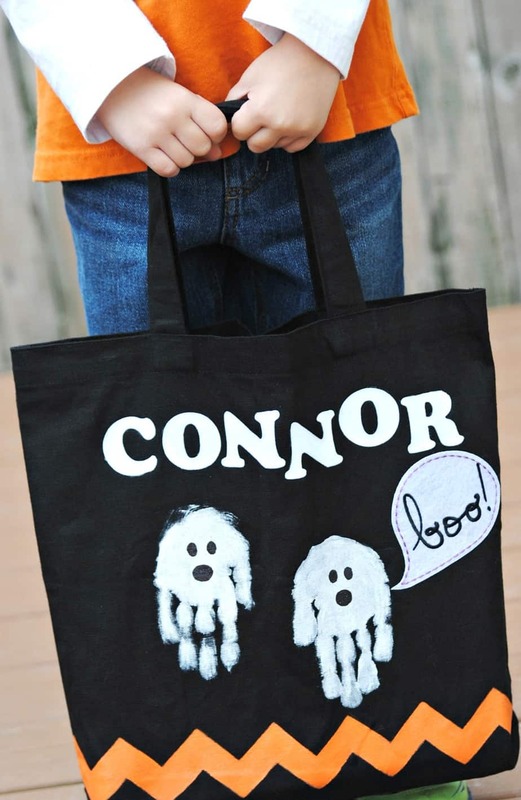 Kara I absolutely love this trick or treat bag..the handprint ghosts are awesome! How cute I love this I wish I had the patience to do my own DIY Halloween stuff especially a bag for my little girl to go trick or treating.. Thanks for the coupon too..
Great kids’ bag! Also a nice keepsake. Great idea to do with the kids! !